Pack Type: Pack type available in bags as well as pouches. Apply on Hands, Nails etc. Peel off when Dried and Wash Gently with water only. Note: To Remove Wash with Soap and Water 2-3 Times. BEWARE OF IMITATION and identical name it may contain harmful chemicals, which may effect your skin. We offer qualitative range of Mehandi Cone outsourced from the local market is made from raw henna leaves that ensure top most quality in the final product. These are safely packed in moisture proof pouches. Being one of the trusted organizations in the market, we are indulged in providing a wide range of Henna Cone. Backed by years of industry experience, we are engaged in offering a premium quality range of Henna Cone. We are one of the leading names in the market, trusted for offering high-performance Mashhoor Mehandi Cone. Golecha Henna ConeHenna contains 24 cones in a box. Only for HandsHow to use :Apply on Hands, Nails etc. Peel off when Dried and Wash Gently with water only. Note: To Remove Wash with Soap and Water 2-3 Times. BEWARE OF IMITATION and identical name it may contain harmful chemicals, which may effect your skin. A perfect choice for routine or occasional events, Aaradhya Mehandi Cone is designed as a compete tool for your mehandi designs. 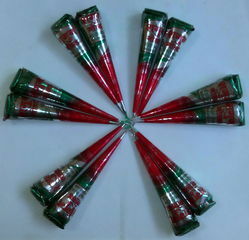 One of the most famous and genuine henna cone in market, Aaradhya cone is made using finest quality mehandi leaves. For longer lasting and beautiful dark maroon designs on your palm, always buy yourself Aaradhya Mehandi Cone. This product helps in converting hours job in minutes. This is a ready to use products for making beautiful design & tatoos on hands, feet, shoulders or any party of body. This is a 100% natural products contains 100% natural super fine Henna with essential natural oils. This product lasts up to 3 months without any change. 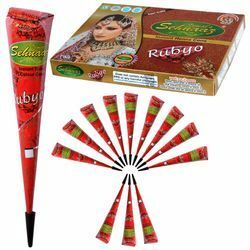 We are offering Henna Tube Cone which makes the mehandi tattoo easier. The cone is filled with henna paste and provided with an applicator nozzle. This helps in creating beautiful and long lasting designs on hands and feet easily. Royal henna cone is a ready to use natural henna in paste form, for designing hands and feet. the cone is provided with specially designed applicator for creating beautiful designs.